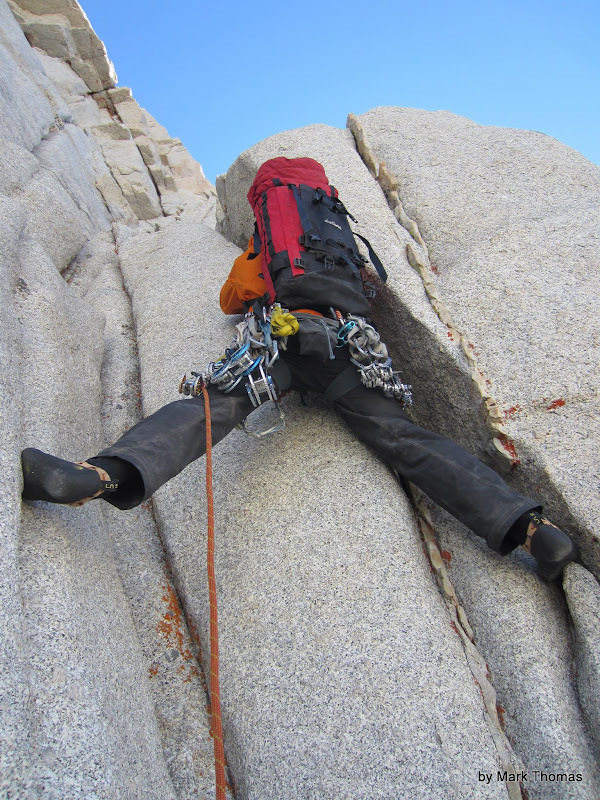 Jared following our linked pitches 3 & 4 on Mithral Dihedal. Sweet and sustained hand and fist jams all the way! 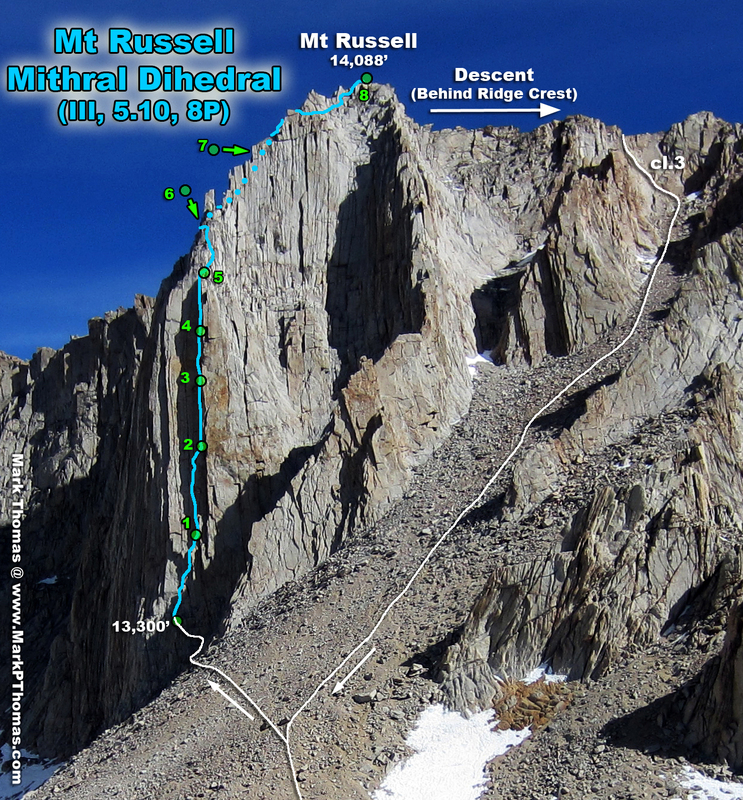 2012-05-12 - Mt Russell seen as we passed the Sierra Crest. 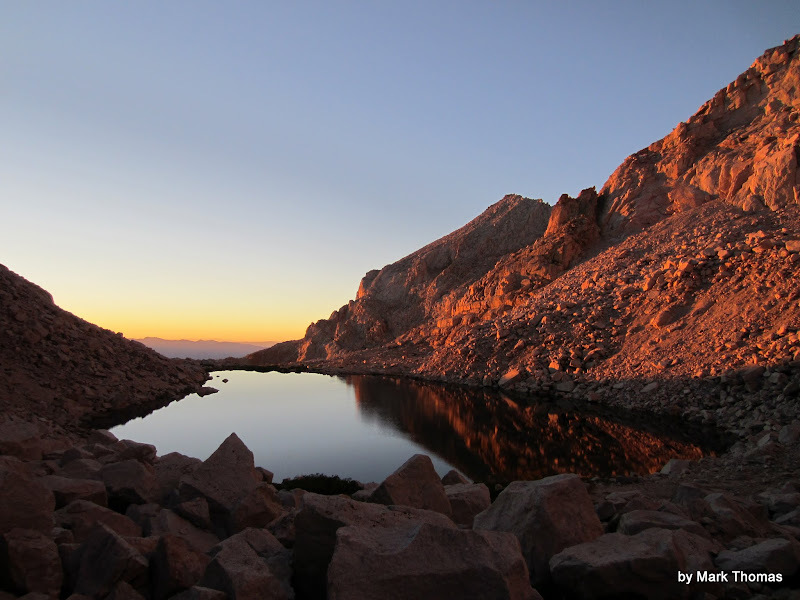 Alpenglow on the cliffs above Upper Boy Scout Lake. Upper Boy Scout Lake at sunrise. 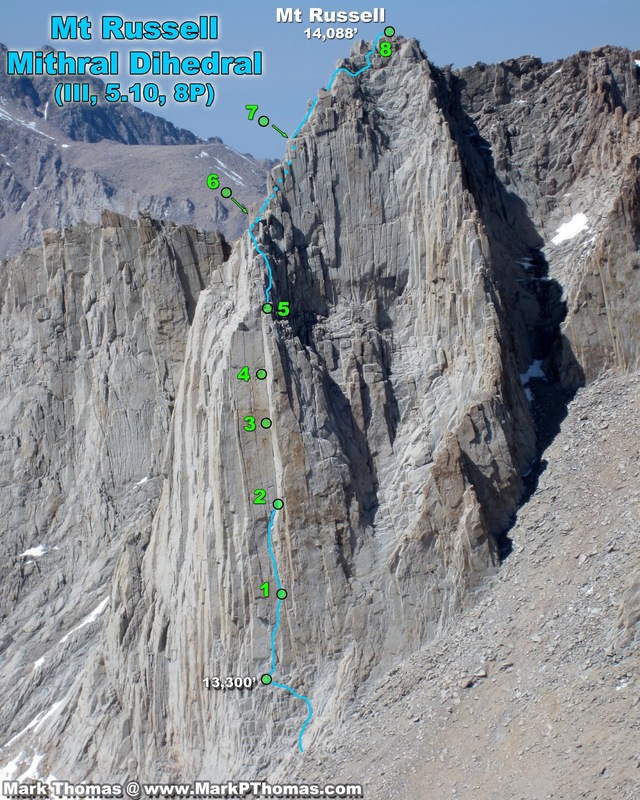 I thought I remembered there being a way to the SW side of Mt Russell from the SE side, and as I have been up to Iceberg Lake a few too many times, I suggested we try this other variation and Jared was game for it. We later learned that our route passed through what is called Sakai Col. 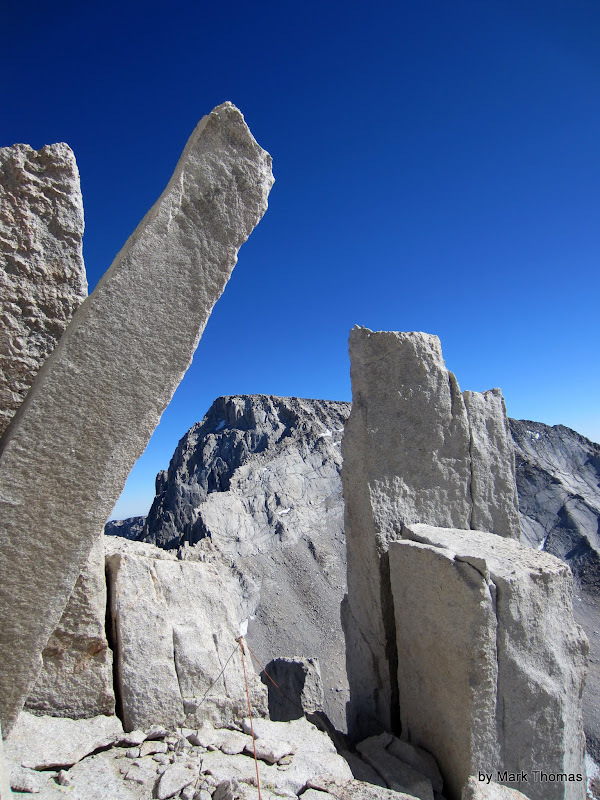 This variation gave us some very interesting views of some seldom-climbed aretes on Mt Russell. 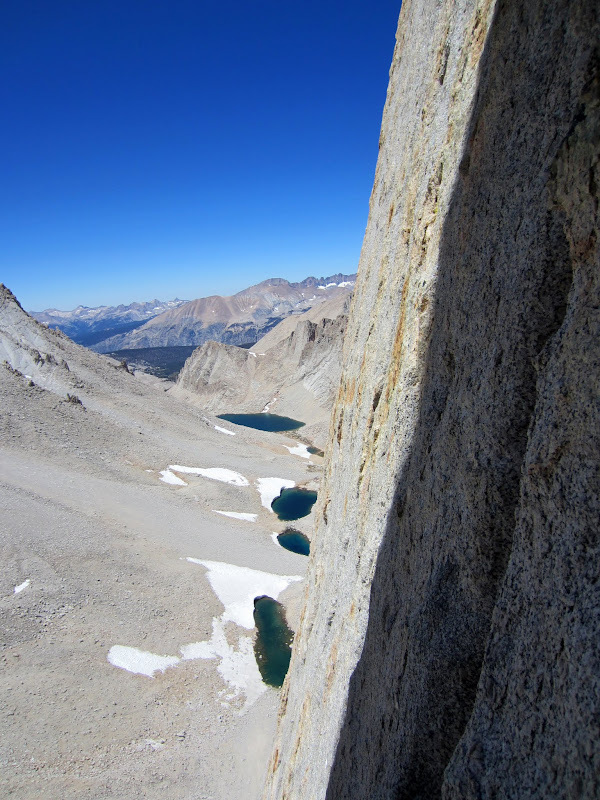 Although this col requires an obnoxious amount of slogging on sandy side slopes and a big switchback, I think these unexpected views made this approach variation worthwhile. Lone Pine Peak and its North Ridge in profile. 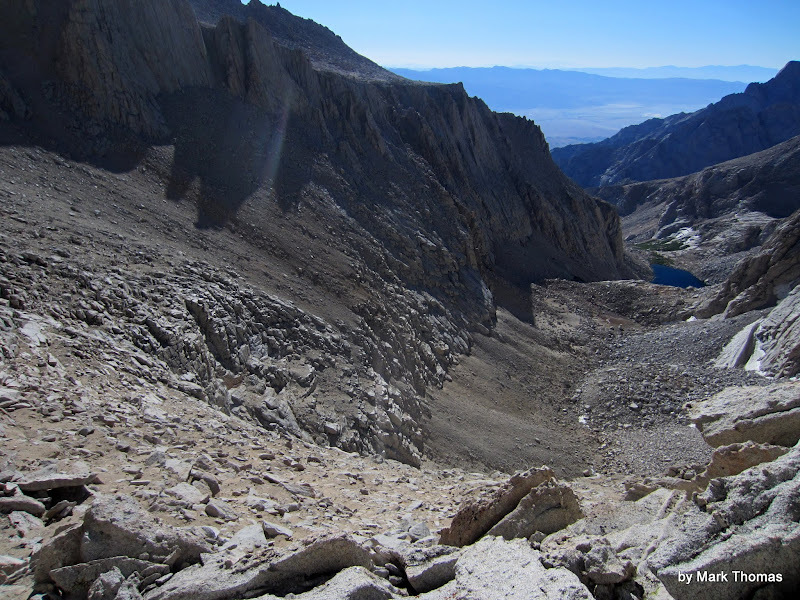 Looking down from Sakai Pass to Upper Boy Scout Lake. 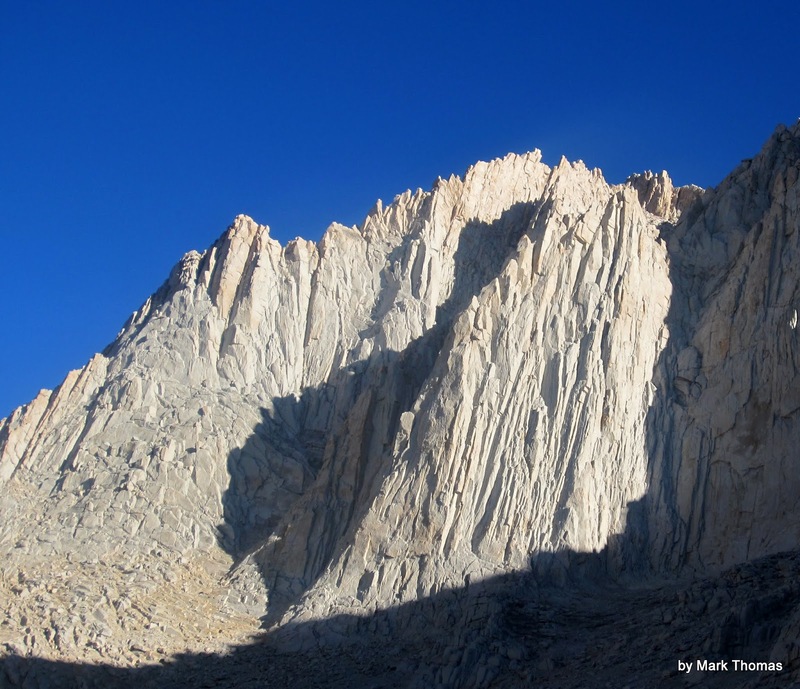 SE Face of Mt Russell, Right Arete. 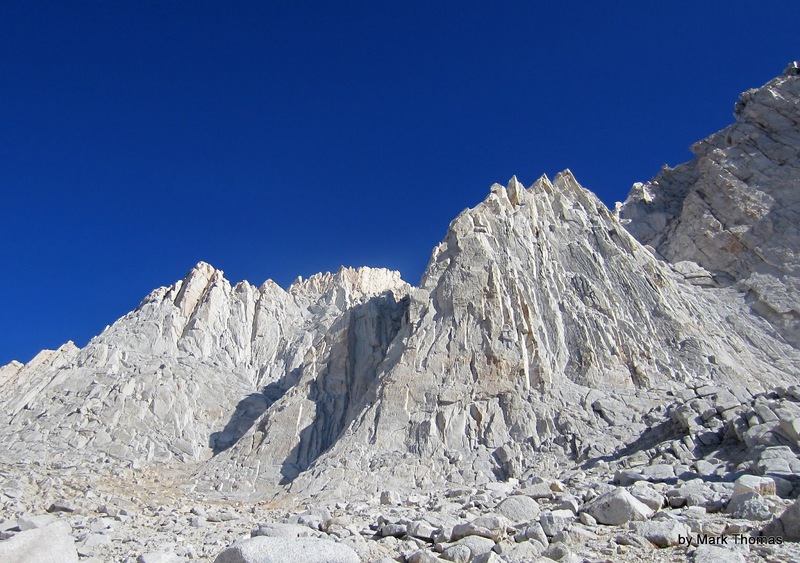 SE Face of Mt Russell, Left Arete. 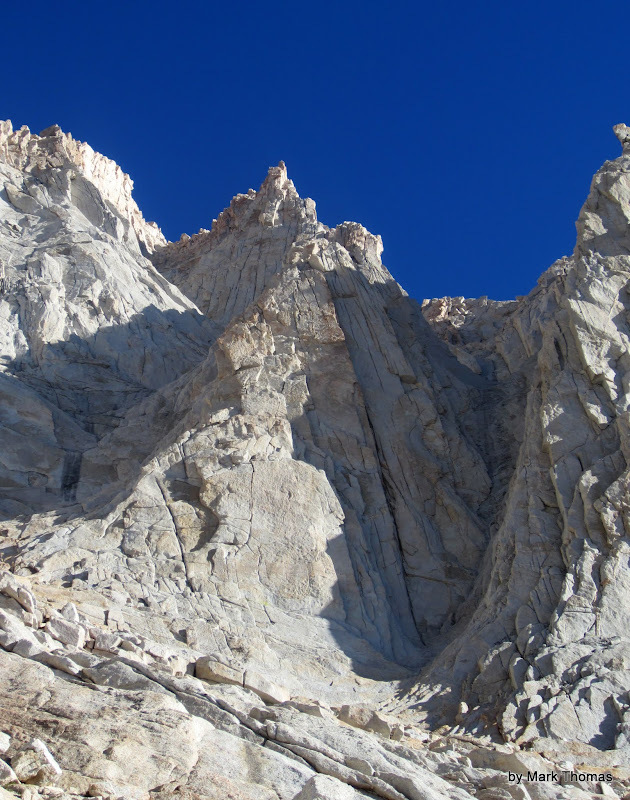 SE Face of Mt Russell, upper section. 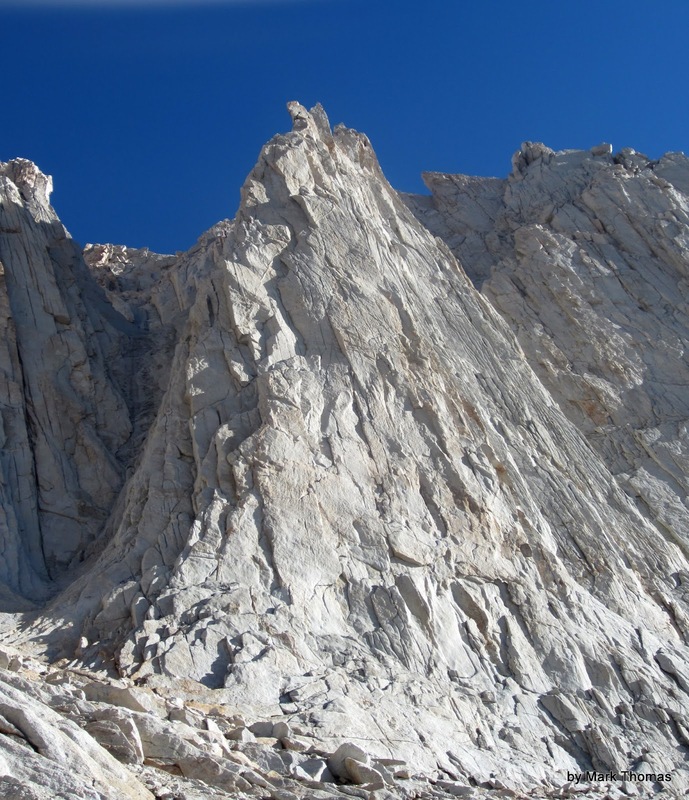 Stacked blocks on SE Face, L Arete, of Mt Russell. 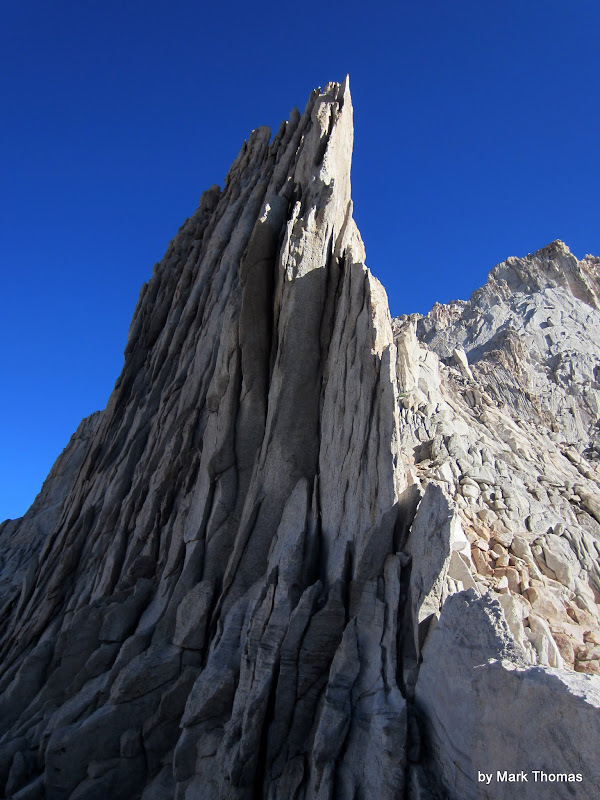 Cool rock fin at Sakai Pass. 2012-05-11 Mt Russell seen from the E Buttress of Mt Whitney. Sakai Pass, which we took to get to Mithral, is barely in view in this photo. 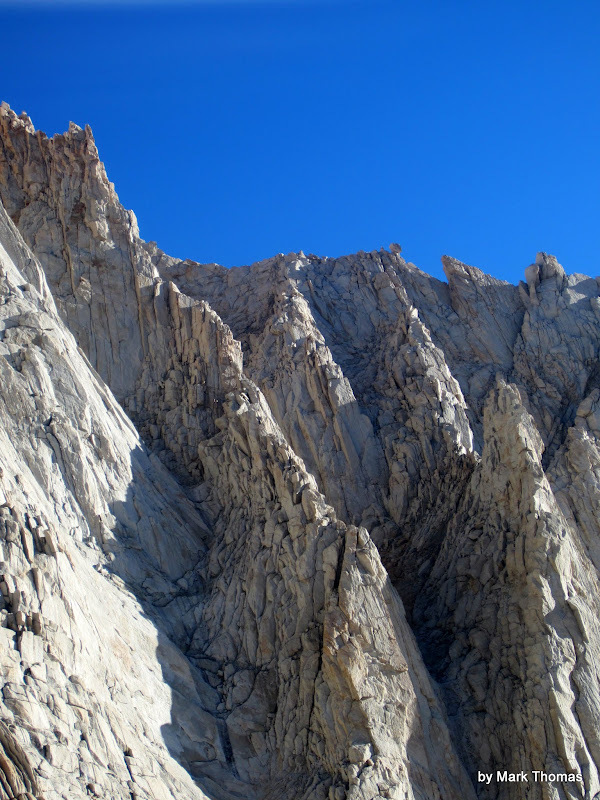 SW Face of Mt Russell. 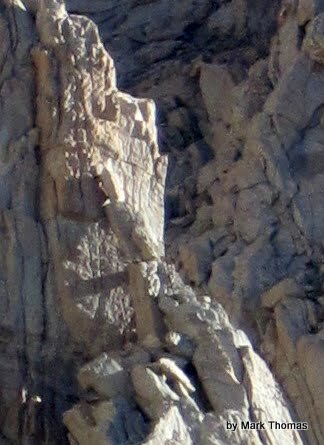 The upper half of the extruded face of Mithral Dihedral is in sunlight. SW Face close up from base. 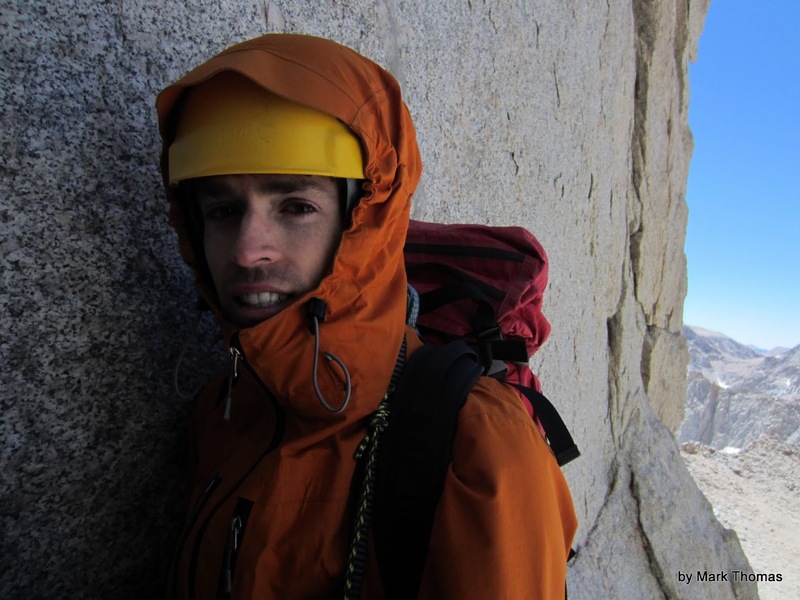 Jared had been feeling more confident with leading harder alpine trad, and by this trip he felt like he was solid in 5.7 and could maybe do 5.8. So we agreed that he'd lead P1, and then I'd take over from there as the P2 5.8 might be a bit tough for him. However, Jared had trouble telling where P1 ended. When he shouted down to me, all I could shout back were some vague landmarks. 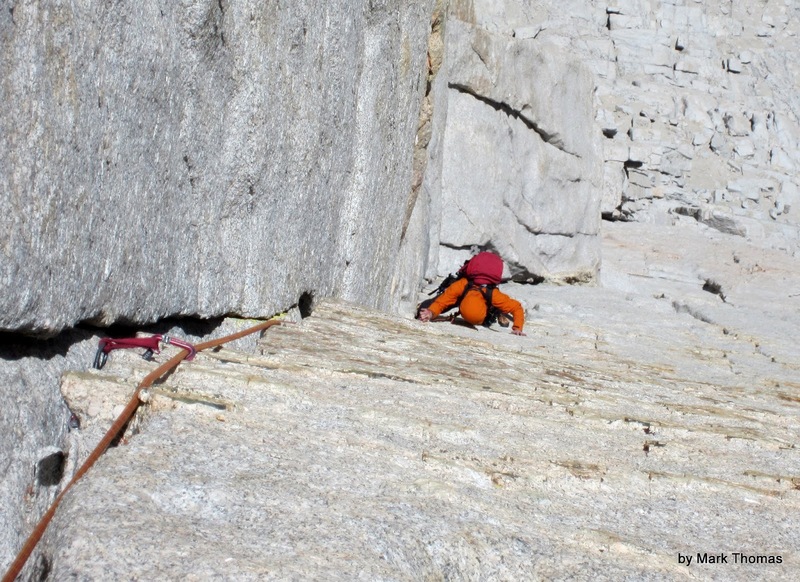 At some point it became obvious that he had missed the belay and was leading into P2. 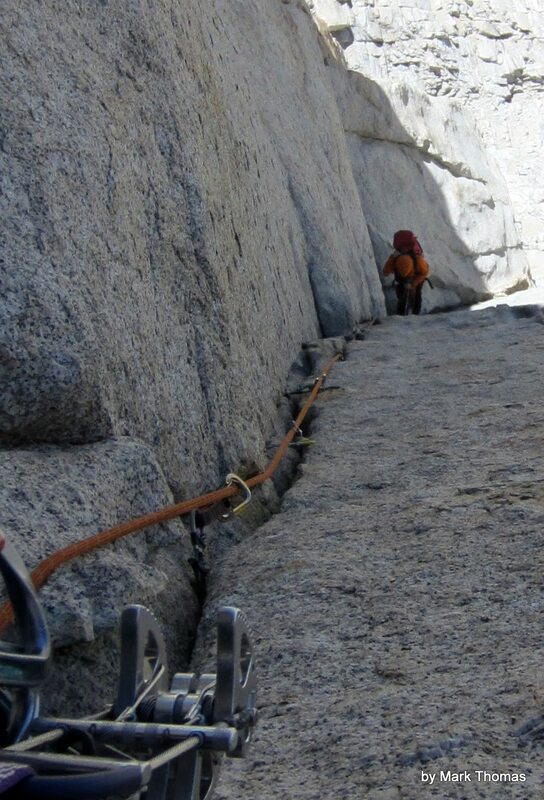 I wondered if a 60m rope was enough to link the two, and my answer came as I ran out of rope and I had to simul-climb a little bit for Jared to finish P2. Following P2, near 5.8+ crux. This corner was great! 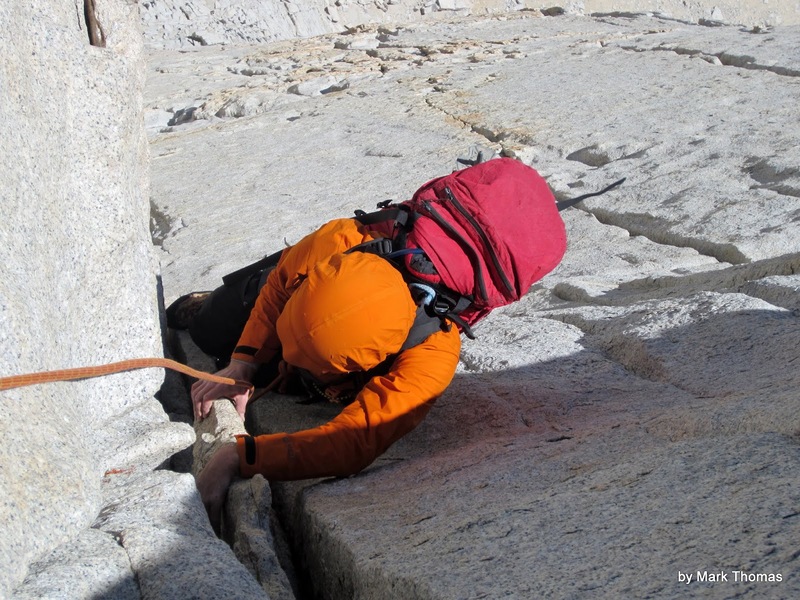 Never too hard, and although it was very physical and sustained, you could almost always get a good rest. 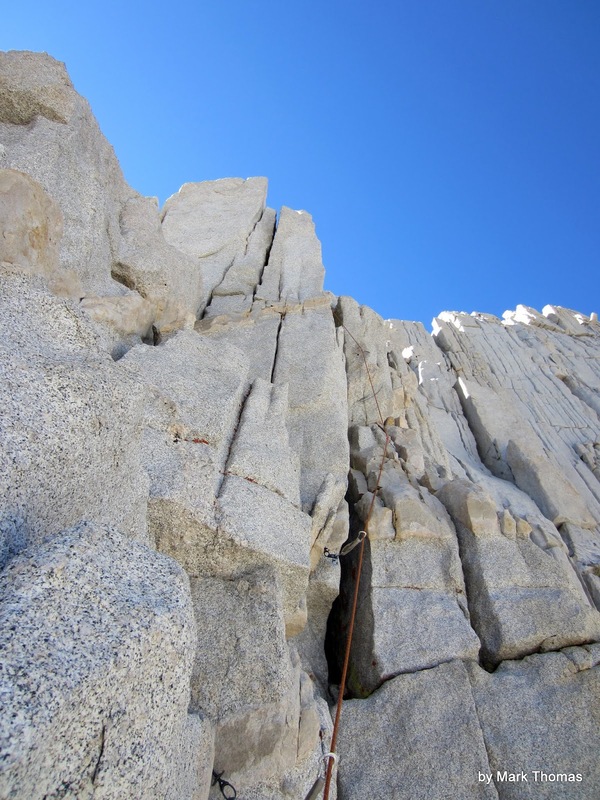 I basically climbed a body length, found a rest, panted my guts out, then continued, ad nauseum. For extra value, we linked the 3 short pitches into two long ones. If you bring the rack suggested by Croft (or a slightly different one on MountainProject), which is on the heavy side (doubles to 3, and triples either in finger or had sizes), you will have enough gear to do that comfortably. Leading P3, linked with P4. P4 disappears over the top where the angle eases a bit. Looking across to Star Trekkin. The profile gives you an idea of the sustained steepness of the Mithral corner. P4 OW. I linked this with P3 into one long 200' pitch. 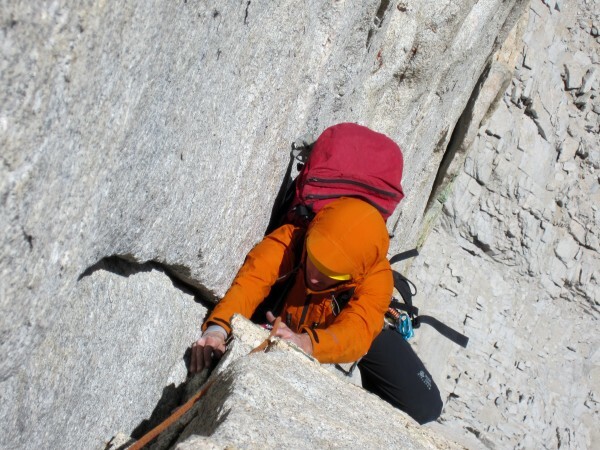 The offwidth is nothing too bad. Even with a pack on at altitude I didn't find it too hard. 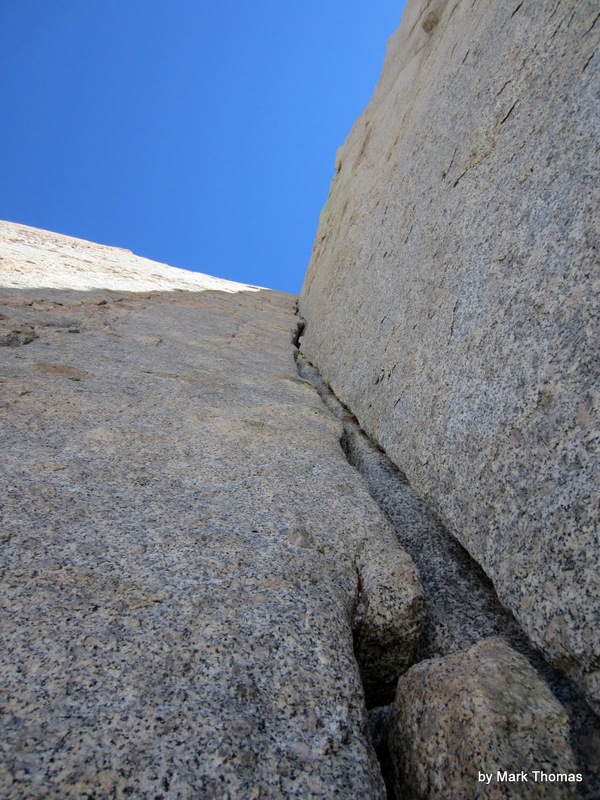 One especially nice thing about it is that there is a thin crack alongside it that takes good gear, so there is no need to bring large cams or run this section out. Very comfy. Looking down P4 from above the OW. 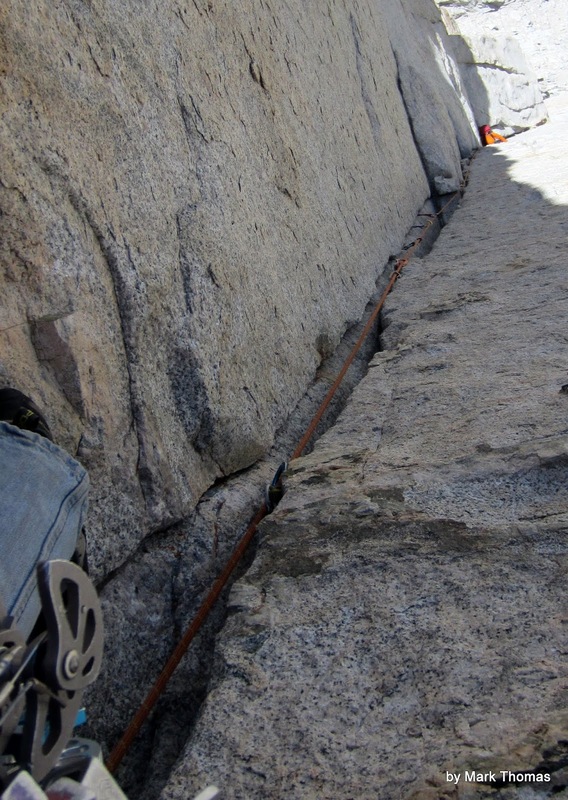 Note the small gear used in the crack along it. P4 above the OW. It steepens up near the end before the angle eases. This adds some unexpected flare to the finish. Getting to the steep bit on P4. Looking down from the steep bit on P4. Jared following P3 and P4. 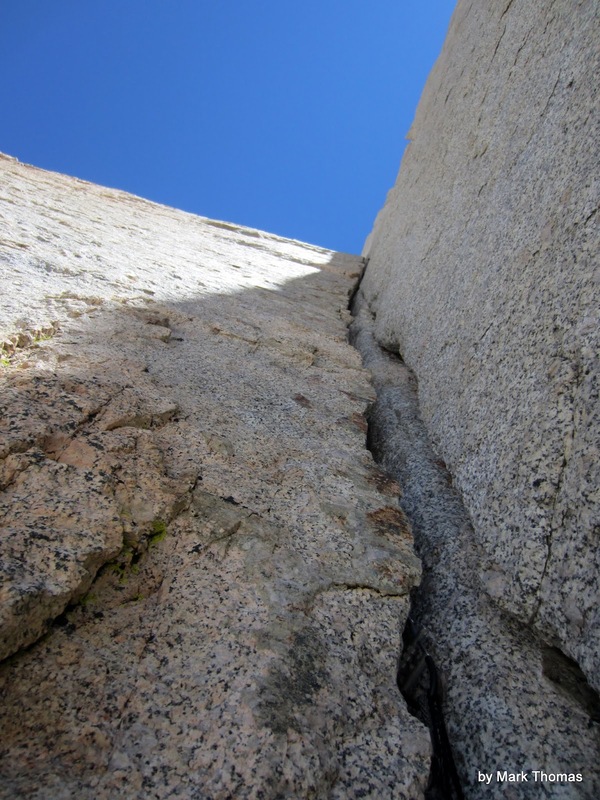 P5 OW and the steep lieback-stem crux above. This next OW was low angle and wide, so it was even easier than the last one. More like a squeeze chimney. I hate liebacks, so I jammed the lieback flake. 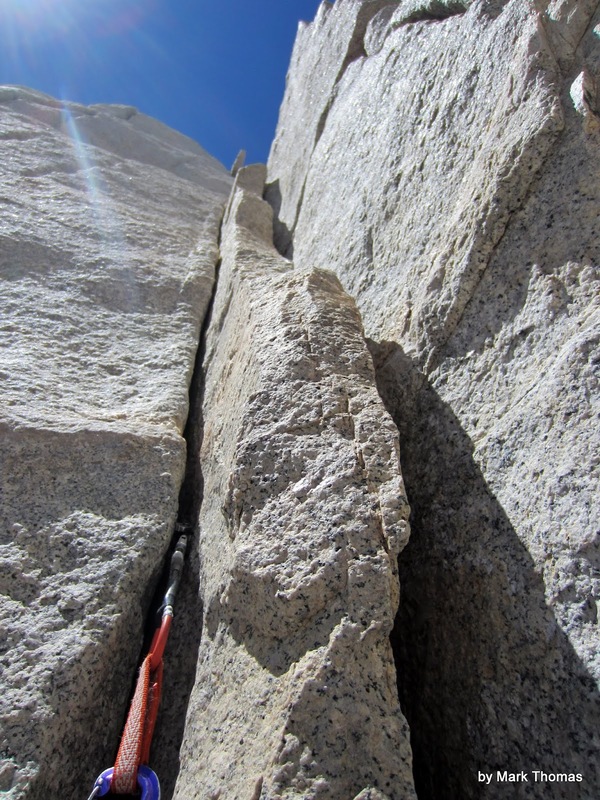 This led to some stupidity on my part as at the end it is better to transition right to a crack in the face. Hanging on a thumbs-down jam with my left hand, I twisted to my right and reached for the crack. My shoulder was not happy with this, so after some hangs to make sure I didn't dislocate it, I set my left hand jam thumbs UP and then transitioned. So much for getting this clean! Doh! 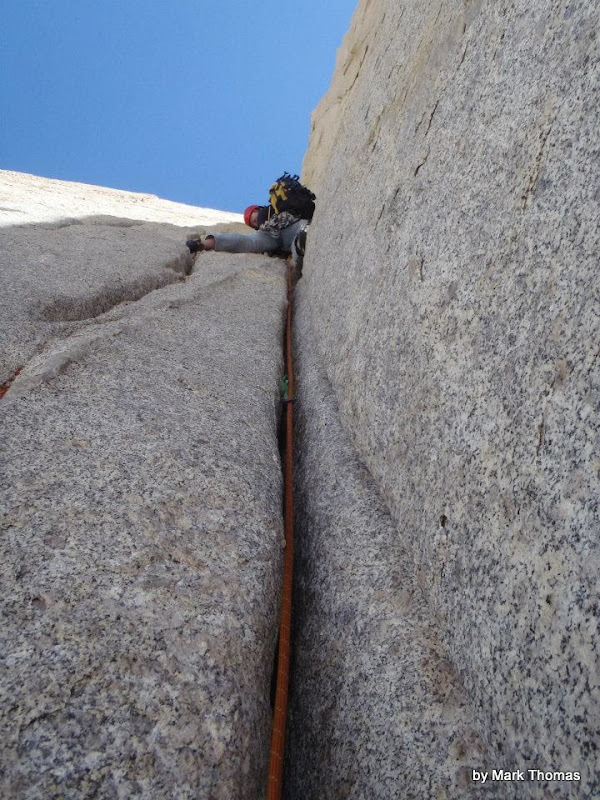 Jared following the P5 crux. 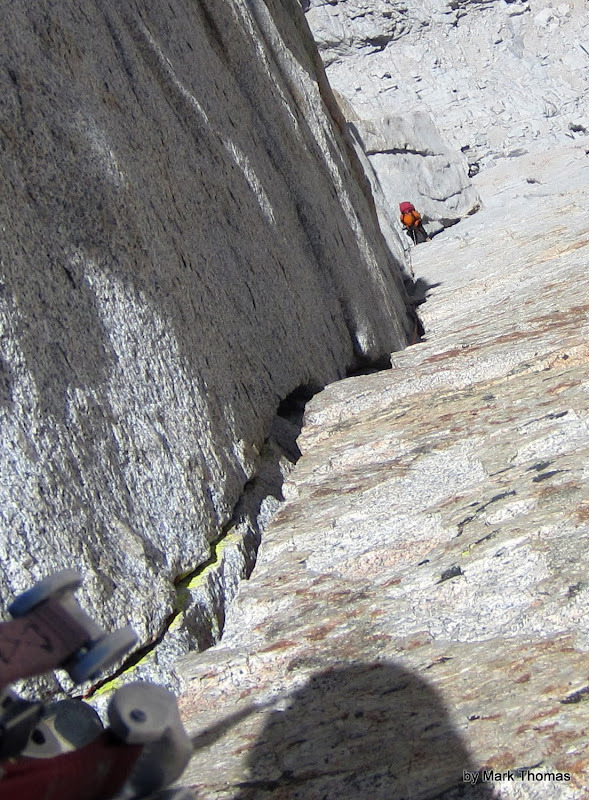 Jared is more of a face and sport climber than me, so he just waltzed up this part. 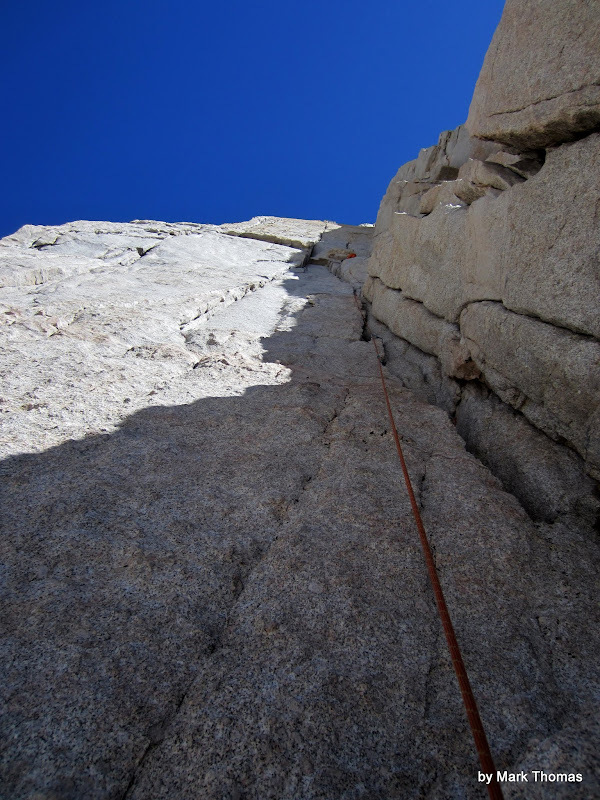 Unfortunately after P5, the real fun is over and there are a number of easy, wandering, mediocre pitches to the summit. They aren't bad, but after such a good route it was a bit of a downer. After Jared led P6, we decided to simul-climb the rest to get it over with faster. That worked well. 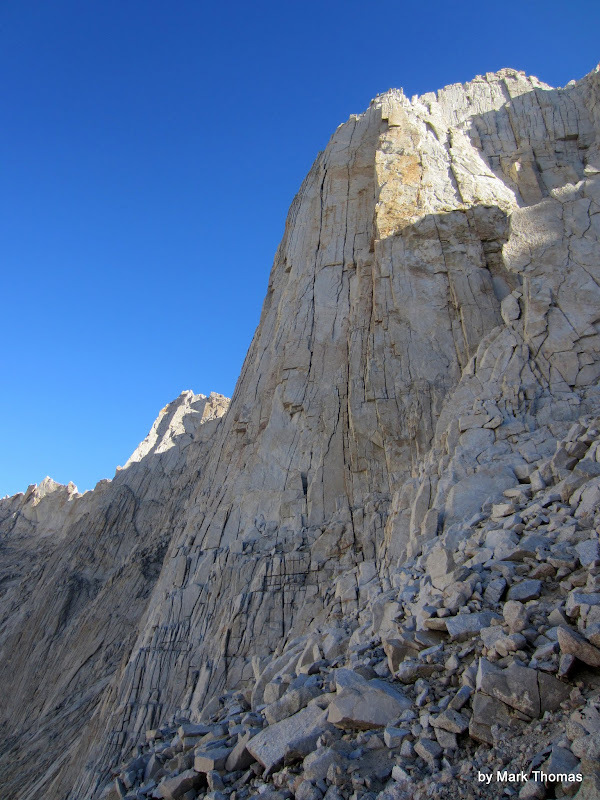 Blocky terrain of the P7-to-summit simul-climb. 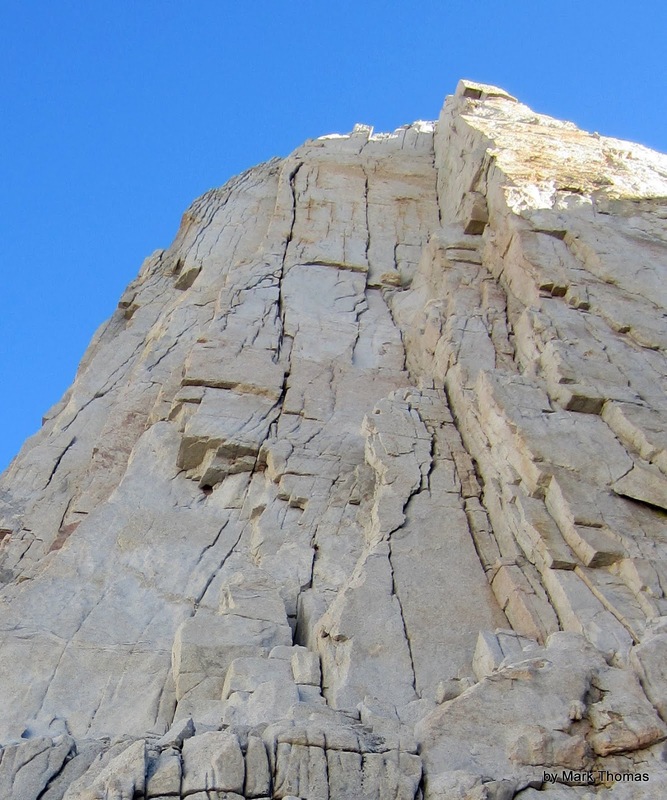 Blocky terrain of the P7-to-summit simul-climb. The block on the right is the large gendarme seen in profile from views of Russell from the S.
After enjoying the summit for a bit, we descended the East Ridge to Carillon Pass, and then down the lousy scree chutes to Upper Boy Scout Lakes, reaching the bottom just after we needed to turn on our headlamps. It was an exhausting day, but an absolutely wonderful one in the mountains with a great friend. 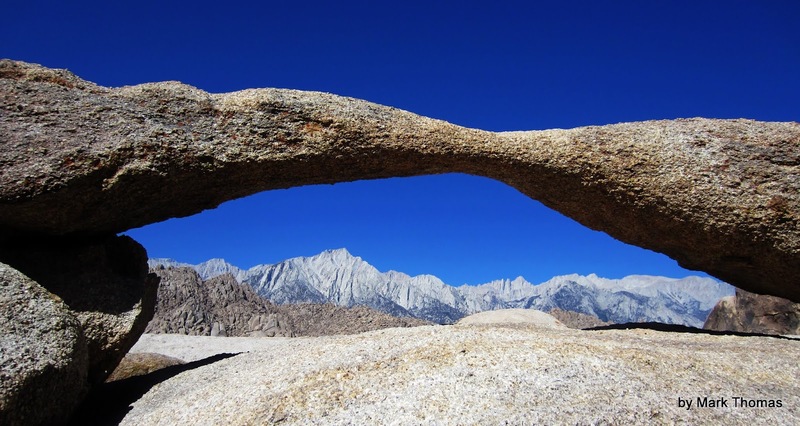 Mobius Arch and Lone Pine Peak. 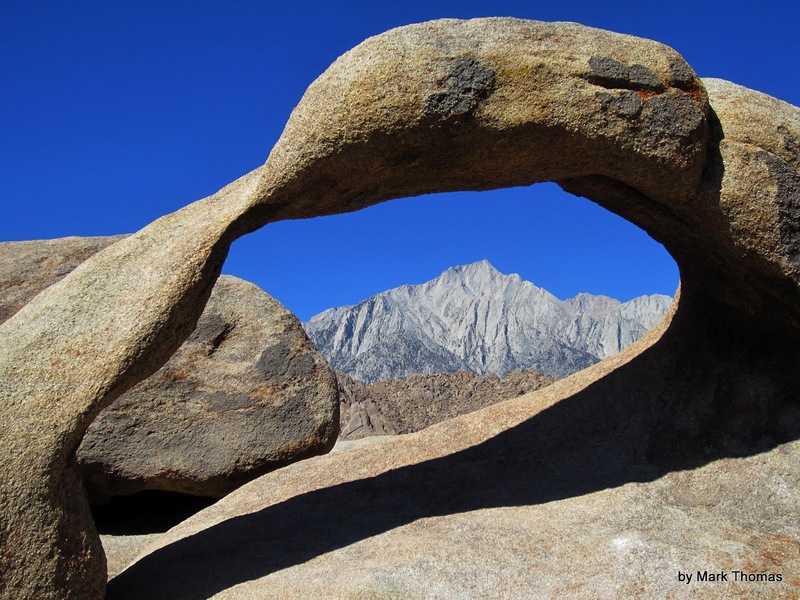 Unnamed arch near Mobius Arch, Lone Pine Peak (left) and Mt Whitney. 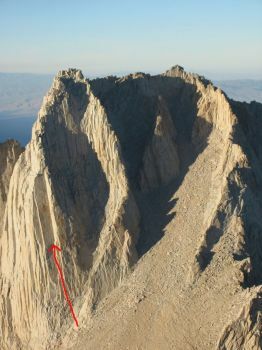 2012-05-11 - East Buttress - Mt Russell's Mithral Dihedral and Fishook Arete from the E Buttress. 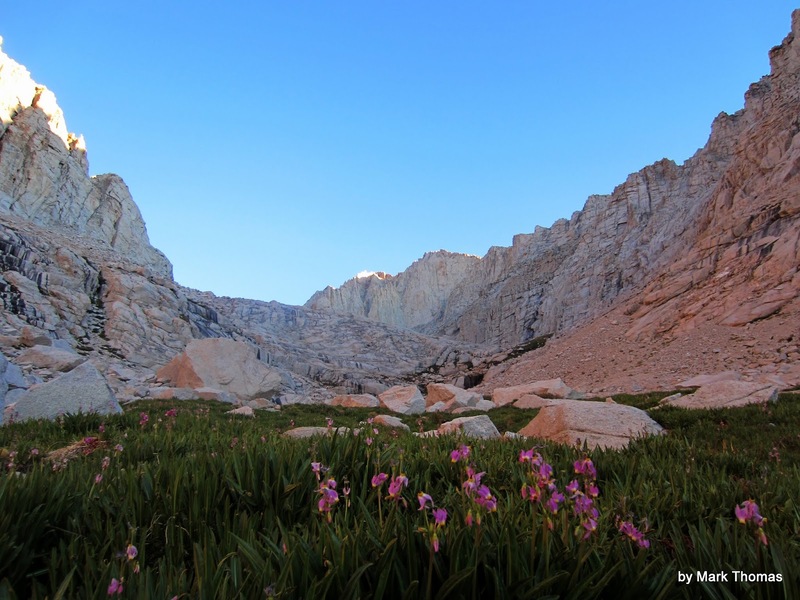 2012-05-11 - East Buttress - Mt Russell from the E Buttress. Awesome TR! 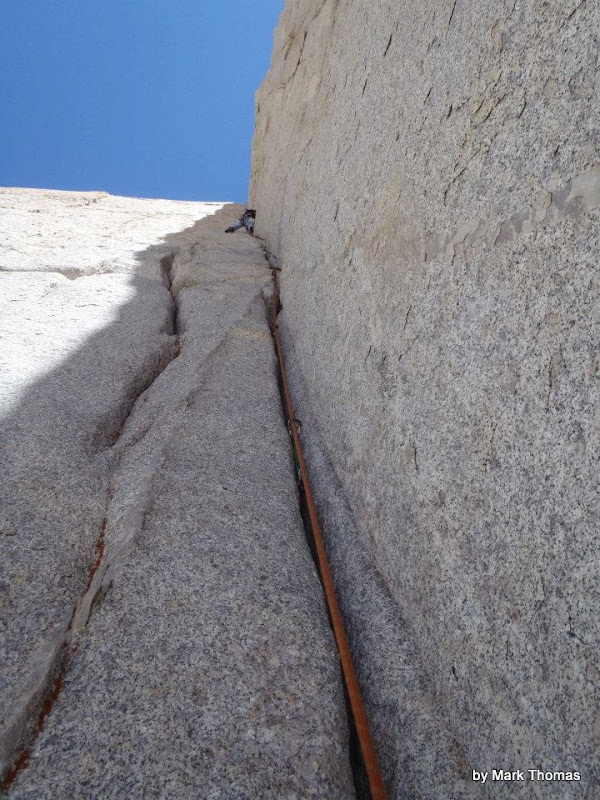 That route has been on my list for a while. Car to Car! Nice style points. 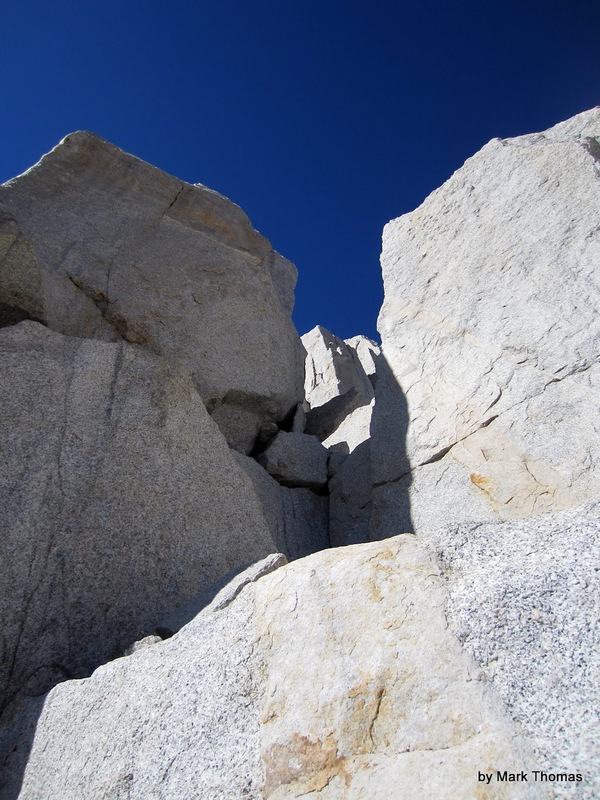 Great photos, thanks for posting.......very alpine! Super Sweet. Thank you for posting!!! Thanks......looks great, just added to my short list! Donini, for a fast and strong climber like you, I've heard that a good way to get even more bang for your buck is to climb Star Trekkin' first (which shares the same first two pitches as Mithral), and then rappel Mithral (leaving gear behind) and then climb the 2-3 pitches of Mithral Dihedreal (cleaning that gear!) before doing the easier pitches to the summit. From photos it also looks like you might be able to do something similar with Bloody Corner? 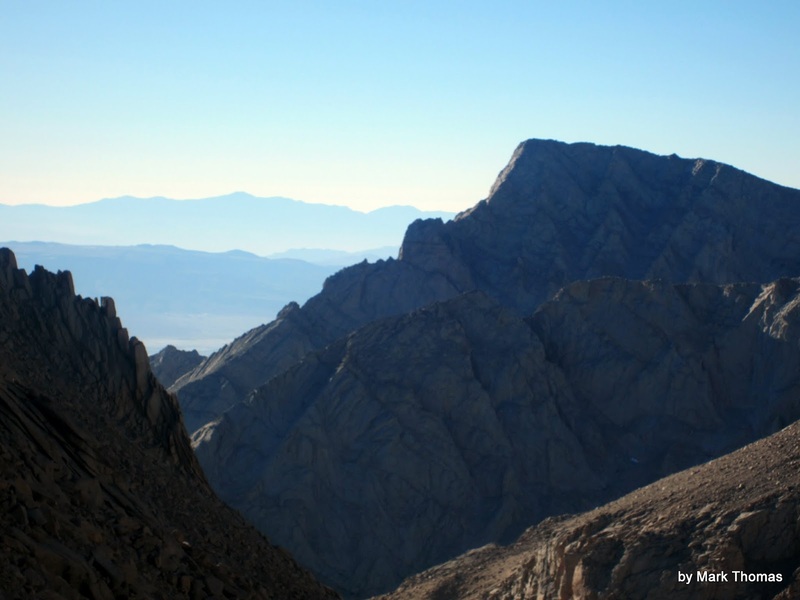 It looks like you pass above the main pitches of ST & MD on your way to the summit for that one too. Now THAT would be an epic day! Very nice pics......got me amped!!!!! 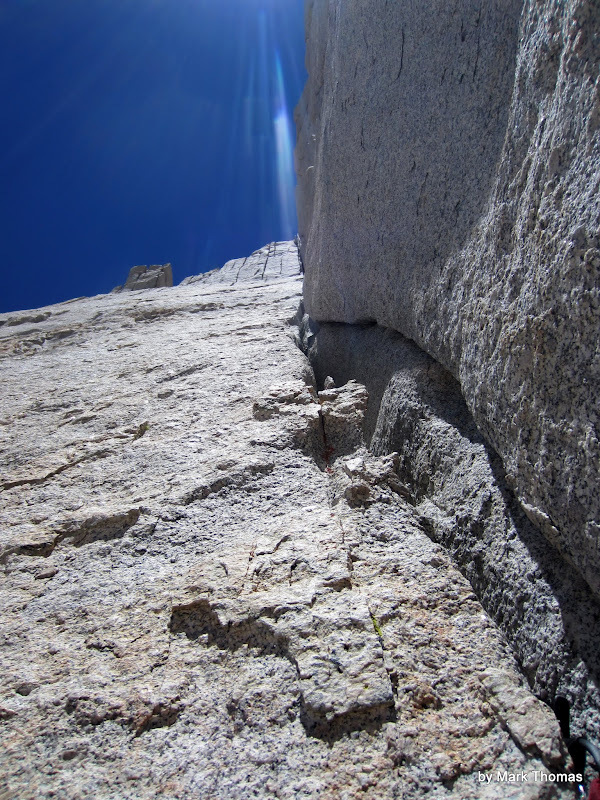 Mithral, Startrekkin', and Bloody Corner all end up on the same ledge system (just before all the simul pitches). You could conceivably rap to the money pitches of any of them from there, although Bloody Corner might be more difficult than the other two. After the name sake corner, it moves left a bit, so getting to the top of the corner might be interesting on rappel. Wow! Fantastic pix. and report. 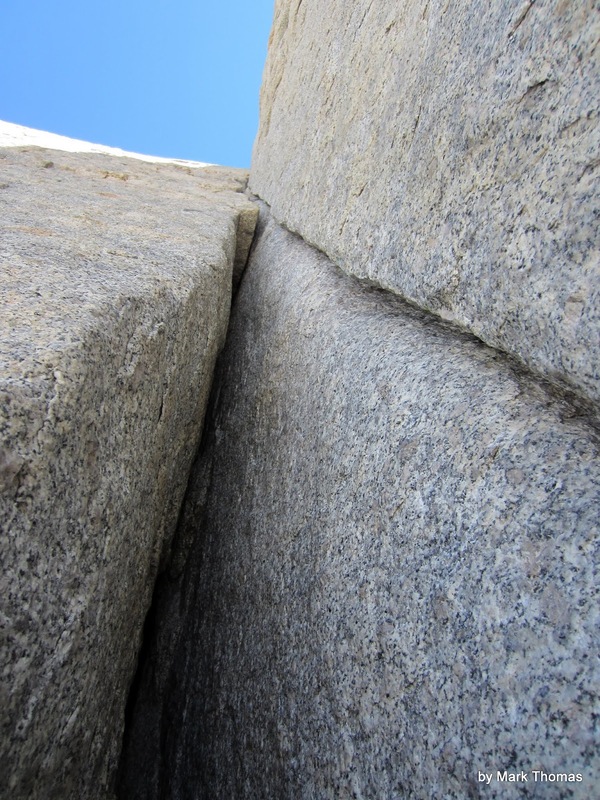 You Cali folks and your perfect granite with splitter weather really live in paradise. It's on my list of routes to do now - thanks. Nice job Mark. Worth the wait!!! Great TR, I bailed on Mithral last summer as lighting and rain started around us, but not before that stinking OW got the best of me. I'm in better shape now and heading back to take care of business this summer. Pellucid, is yer day job writing guide books and trip reports? I'll be here awaiting yer next gem. The perfect model replicates reality 1 to 1? Oh, but you can't capture scale! Nor sound, smell (ugh), temperature, nor texture! 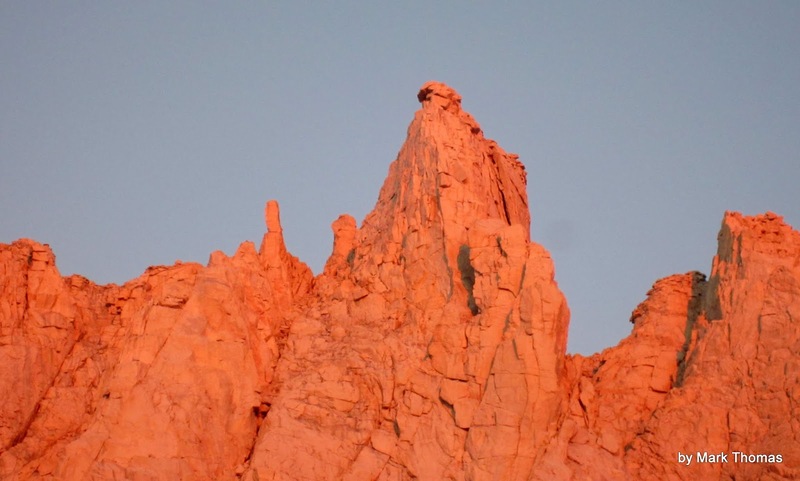 The endorphines from a vigorous approach don't come through as well, either - that wonderful ache in your body that tells you that you've accomplished something for the day. Even the best models merely provide inspiration and guidance for doing the real thing. I'm with Donini - short list. Makes me want to cry that I still haven't done this. Mark, you have been a prolific trip report machine in years past, including some really great objectives that make me drool. I don't think I've managed to read them all yet. Le_bruce, what is your cardio status? Can't imagine it would ever be less than mine. Maybe keep some of the special meds handy in case of headaches? My time is in mighty short supply this summer but Mithral Dihedral or Star Trekkin is on my radar. 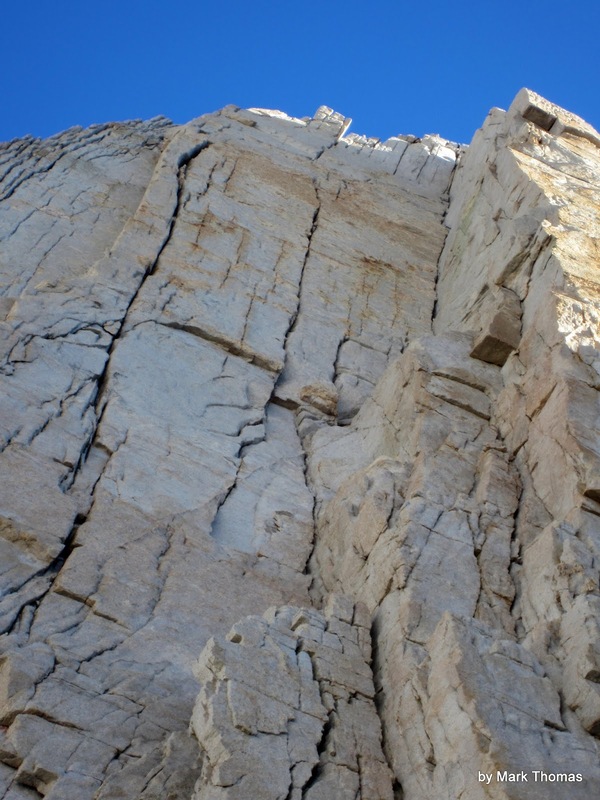 Batrock, I was thinking of asking you to do this climb this summer before I saw le_bruce also interested. I'll probably be able to get in 2 adventures this summer apart from whatever the kids and I do. If leBruce cannot make it I would be more than interested. I got stormed off it a few years ago and have been itching to get back and do it. Great trip report....looking to get on this in the coming weeks....anyone been out there this year? How is the conditions? 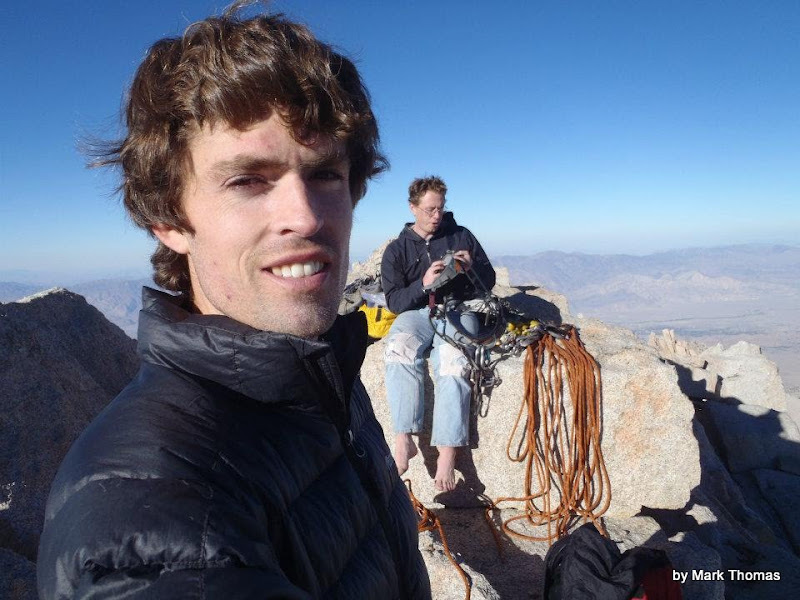 Hey Mark, question for you: Do you think the Sakai Col is faster than approaching via Iceberg Lake when doing car-to-car? 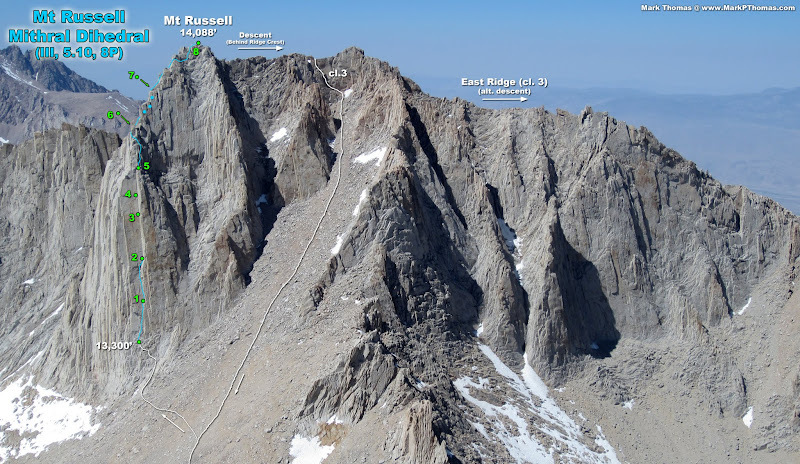 It looks faster/shorter/more direct from google maps, but then have to carry more water weight from Upper Boyscout Lake. I think so. 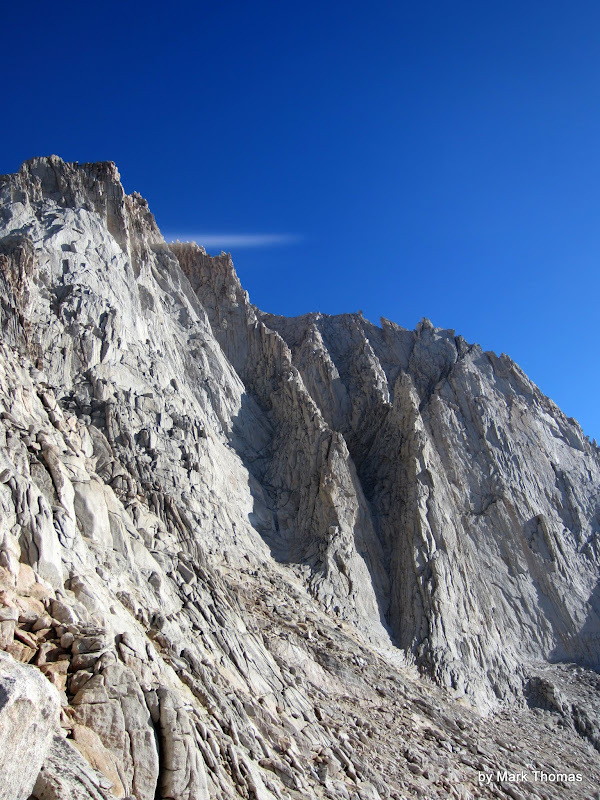 It is more direct without all of the switchbacks or the wider loop of the Iceberg Lake route. You also don't gain as much elevation to lose on the backside. 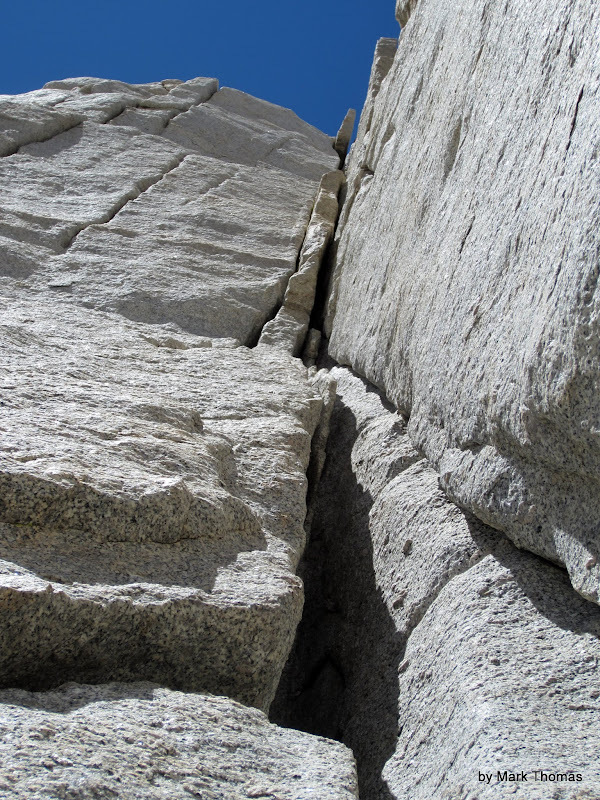 The one caveat is when taking the right line to get above the first set of cliffs. The way we went was sandy and annoying - effort that was a lot more tiring and slow than expected. 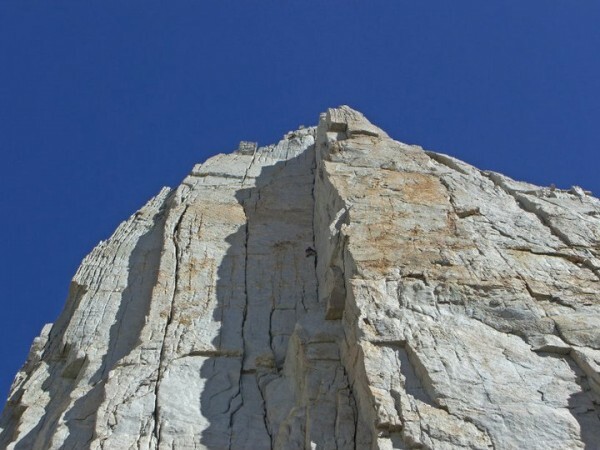 I think you could save time and effort by heading closer to the cliffs, and at the last minute head more straight up on the right side to skirt around them. 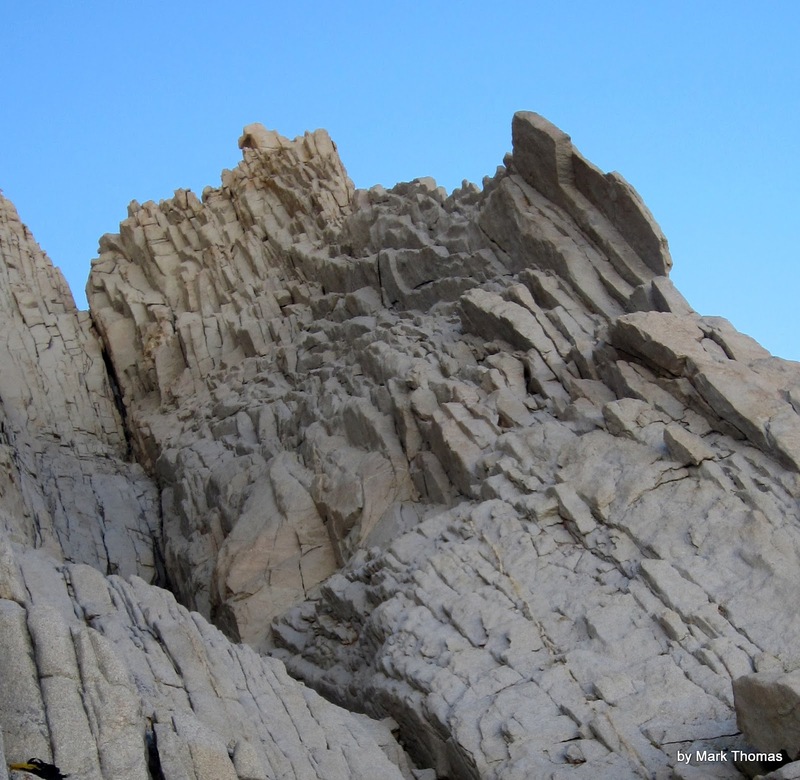 At the very least, it seems to me to be easier to go straight up and down loose sand than to do a long ascending traverse. The ideal would be to do this pass when it is snow covered, as then the sand is a moot point! I somehow missed this one. Holy cow what an awesome TR ! Wow, looks good. That rock is so clean! Wes Goulding solo of the rig! Not a myth.